Rating : 60°C or 80°C, 30 V.
Insulated : Labeled or Complies with manufacturer's AWM Procedure. Singles : May include mixed sizes. 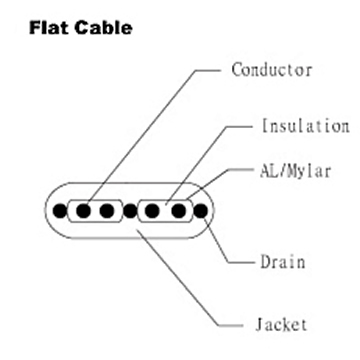 Assembly : twisted insulated singles or groups of twisted singles twisted together or groups of twisted singles may be laid parallel to form flat or oval cable. Lay not specified. Barrier layer and/or fillers optional. May employ a web extruded integrally with the jacket. Manufacturer shall maintain a complete description of each assembly. Diameter of assembly under jacket one inch maximum. Jacket : PVC, Class 43, 9 mils minimum average, 7 mils minimum at any point, before and after ripping if a web is used. Standard : Appliance Wiring Material UL 758. Use : Internal wiring of electronic equipment in Class 2 systems only.